Some areas you can save on and others you can’t when furnishing your home. 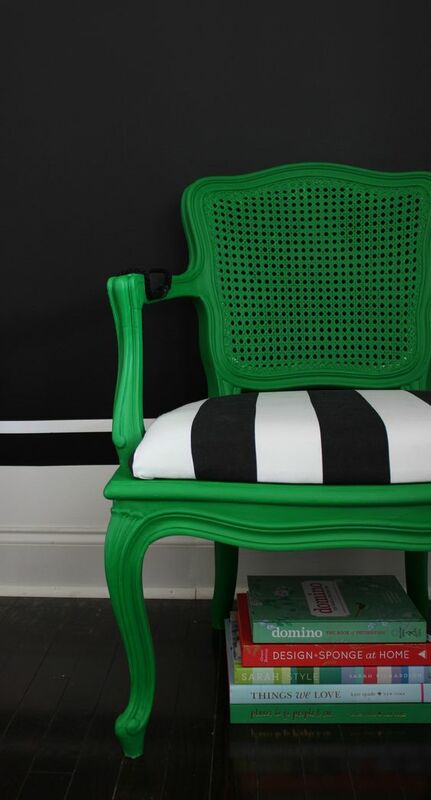 If you like the funky and unexpected, be a bit daring a give that old (and frankly ugly) piece of furniture new life. I always tell my clients, wood isn’t sacred. 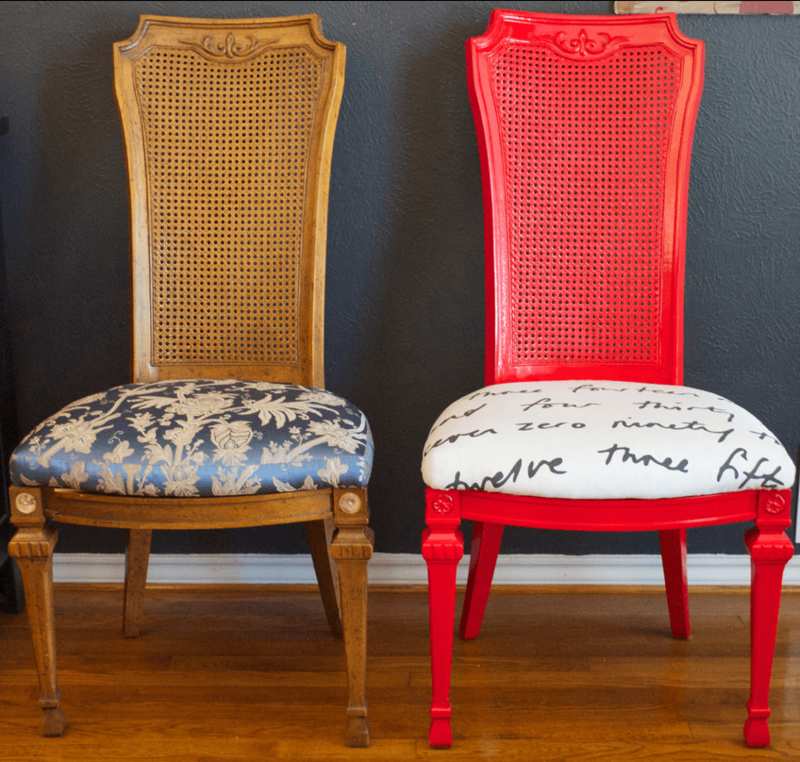 Just a fresh coat of bold paint- whether it be gloss white, red or black, you can completely transform, and frankly fall in love with that old piece. So, what do you have to loose? Here are some step by step instructions for the courageous. Enjoy! Using your screwdriver or drill, remove the screws from your seat cushions and set them aside. Spray each chair evenly with primer and allow them to dry completely. This primer spray dries quickly; the chairs should be ready for the next step within 20 minutes. Follow the can’s instructions and spray evenly and from the correct distance for best results. Allow the color coat to dry completely (about an hour). If you love the look of high-gloss painted furniture, finished the job with a polyurethane topcoat. Staining a bright white fabric with tea is a great way to give your upholstery an antique look.Fill a bucket with hot water and steep 10 or more tea bags. Plunge the fabric into the tea and let it soak for two hours or more. Stir it occasionally. The longer you let it steep, the darker the stain will be. When the fabric has the desired pigmentation, wring out the water and hang the fabric to dry or toss it in the dryer on medium until it’s thoroughly dry. Place the cushion on the fabric and cut around it with scissors, leaving enough space around the edges to completely cover your cushions, including the sides and a few inches of overlap underneath. Fold the edges of the fabric, tucking under the rough edges. This will help keep your fabric from fraying and coming loose over time. Using a staple gun, secure the edge of the fabric to the underside of the seat. When the front is secure, pull the fabric taut across the top of the seat and secure the back lip of the cushion, leaving the sides and corners free. When handling the corners, pin-tuck the fabric and use a few extra staples to secure the overlapped areas. Staple the sides of the cushion last and smooth the fabric with your hand as you complete the job. Make sure the top of the cushion is smooth. When the chair frames are thoroughly dry, reattach the newly covered cushions with a screwdriver or drill.